The fan then swung a punch from behind and caught the Villa midfielder, who fell to the ground. A steward then managed to restrain the supporter and marched him off the pitch. 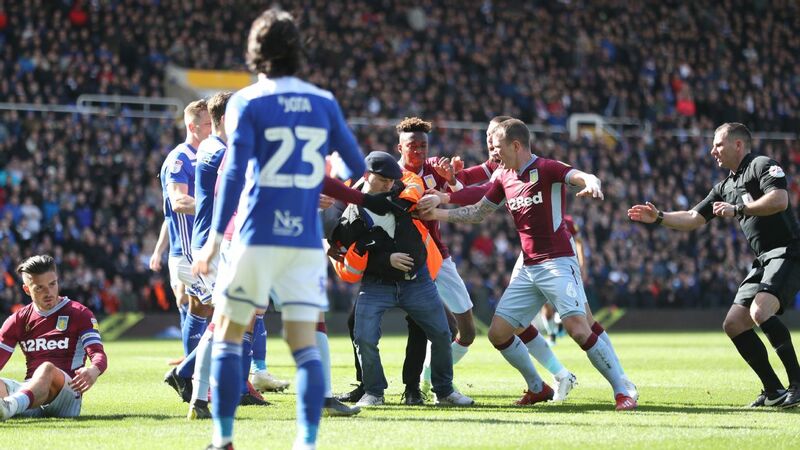 West Midlands police confirmed the supporter had been arrested and later released his name, Paul Mitchell, 27, and said he'd been charged with with "invading the pitch and assaulting Aston Villa player Jack Grealish during the Second City derby." Grealish later scored the winner to make it 1-0 to Villa on 66 minutes. After the game, Grealish said: "I was unaware [of the fan] at the time. We had a throw in or a corner and I was walking into position and I just felt a whack around the side of the face. Obviously there is rivalry in football, but I don't think there is any place for that. "I just tried to get on with my job and I think I did -- I scored the winner. It was unbelievable, in front of our fans and after what happened in the first half. It was something I have dreamed of since I was a little kid. "[It has been the] best day of my life. To come here for first time and captain Aston Villa and score the winner, particularly for me being an Aston Villa fan." Dean Smith, the Aston Villa manager, said: "It shouldn't happen. Security should be better. Unfortunately some mindless moron has gone on the pitch, attacked Jack and you have 15,000 idiots clapping him." Birmingham manager Garry Monk labelled it a "disgusting act and an individual whose behaviour in no way represents these fans or the values of this club and the football family as a whole." 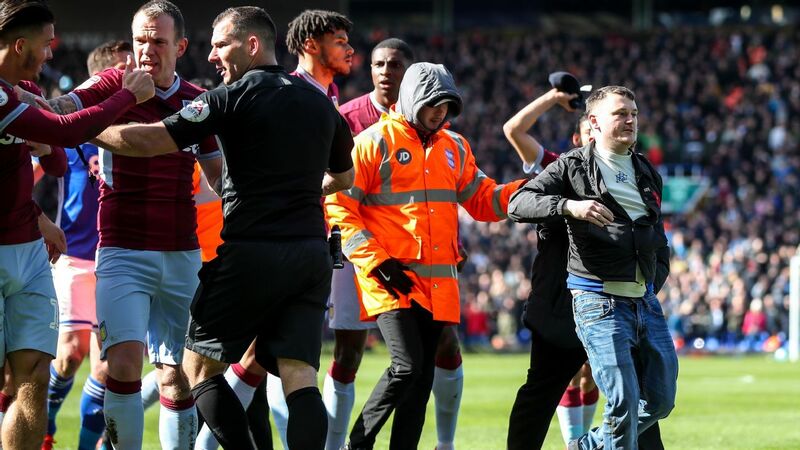 A fan is escorted from the pitch following an attack on Aston Villa's Jack Grealish. An EFL spokesman said: "The EFL condemns the mindless actions of the individual who encroached on to the pitch at St. Andrews on Sunday afternoon. It's a situation no player should ever be faced with. "Whilst this incident falls within the remit of the Football Association, we will work with all the relevant parties to address the issue of player and match officials' safety on the pitch and ensure the appropriate action is taken." 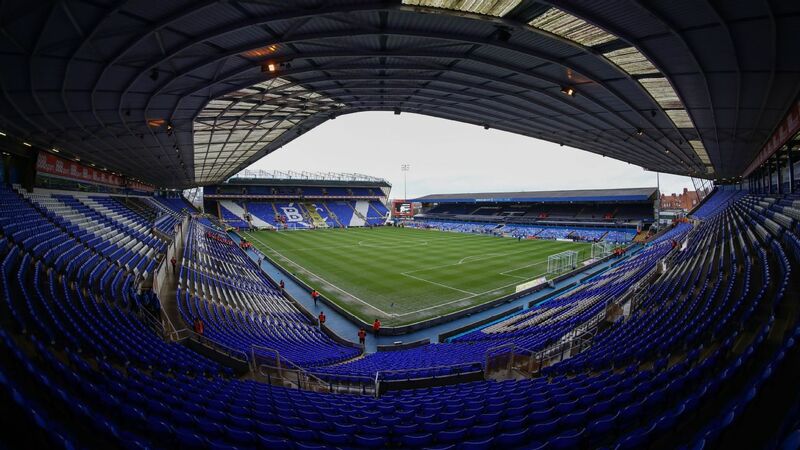 A Football Association spokesperson said: "We strongly condemn the incident in the match between Birmingham City and Aston Villa, which saw a person enter the pitch and assault a player. A Birmingham statement read: "Birmingham City Football Club would like to apologise to Jack Grealish and Aston Villa Football Club for an incident in this afternoon's derby match. Grealish did not require treatment and later scored the winner for Villa. A statement from Villa read: "Aston Villa Football Club is appalled by the disgraceful attack on Jack Grealish during today's game. A red line has been crossed by this cowardly on-field assault on a player, which is unprecedented in English football." 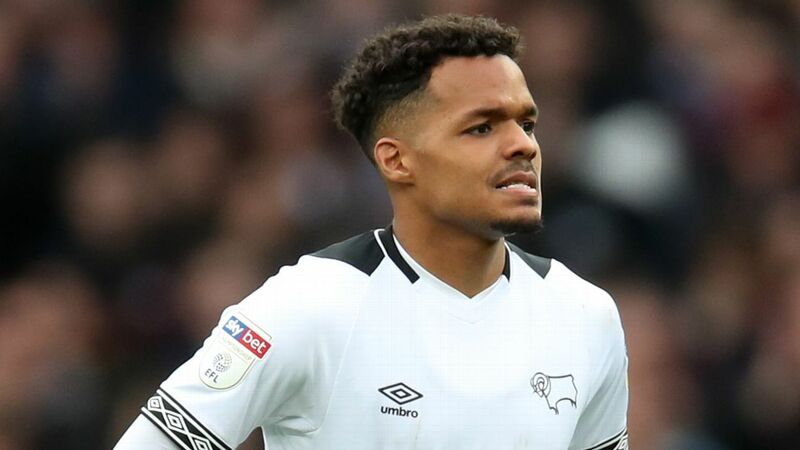 Sunday's act of violence was not the first time the Midlands derby had witnessed a flash point. In 2002, a fan was jailed for four months after entering the field of play and taunting Peter Enckelman, the Aston Villa goalkeeper who had conceded a goal in Birmingham's 3-0 victory at St. Andrews. Michael Harper, 26, from Solihull, was sentenced at Birmingham Magistrates Court after admitting to running onto the pitch before the clash with Enckelman.